An important part of our collaboration with the teacher-leaders in our project centered on reframing a definition of leadership that reflected their core principles about students, teaching, learning, and professional development, as well as their approaches to working with others. Through the vignettes and a series of focus group conversations, together, we defined teacher leadership in a way that emphasizes a focus on students, collaboration with teachers, and a commitment to ongoing learning. 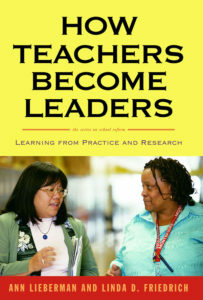 During the focus group interviews that we conducted with 28 of the vignette authors at the final writing retreat, these teacher-leaders articulated what it means to be a leader and how they see themselves as leaders. For some, these were new insights, informed through writing and conversation about the vignettes; for others, this thinking extended their previous reflection on their work as leaders.